I have found it very useful, especially when editing an existing pattern on my Mother 32, to have a written record of the notes and 'embellishments' that I have used, especially when determining which of the four banks of eight notes the edit has to be made in. I have produced a spreadsheet in Excel for entering this detail and attached is a sample of one of my sheets. If anyone is interested in having a copy of the spreadsheet or any suggestions on improving it, just let me know. 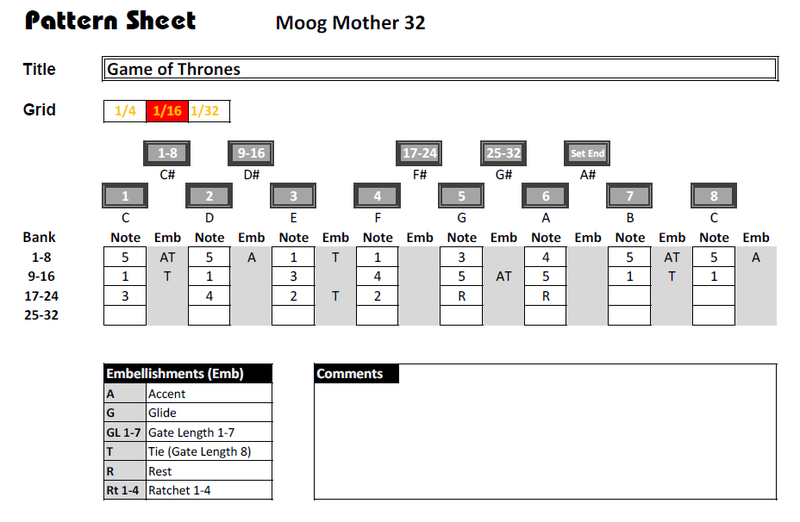 I created my own sheets for my purposes in Visio ages ago, but haven't used them yet (and still not entirely sure where they are) as I now drive the Mother-32 from my Squarp sequencer. Thanks for your comments Ben and Eddy. These simple sheets certainly help me keep track of what I'm sequencing on the M32!